I belong to the Wednesday Poker Discussion Group here in Las Vegas, WPDG, and one of our members suggested that the place to be on a Sunday from 12 noon until at least 6:00 pm is the Aria Poker Room. If your budget or bankroll can handle the upswings and downswings, the action at the Aria Poker Room is a thing to behold. In the five hours that I played in a 1/3 No Limit Table, I saw over $5,000 change hands. There was one gentleman with his personal assistant that bought in for the maximum of $300 and proceeded to gamble it away in less than 20 minutes, reloaded and gambled it away again. His favorite thing to do was to go “all in”. He must have been watching TV poker and thought that this was the best way to play and win. Small and large pots were being pushed to many different players at the table. Many were tourists on their last day in Vegas and they either wanted the action or the chance to break even. BAD BEAT STORY ALERT! SKIP THE FOLLOWING PARAGRAPH IF YOU DO NOT WANT TO HEAR IT! (Bad beats are only interesting the the loser for the most part). I was positioned to receive some of these chips, but, alas, it was not my day. My AA lost to QQQ on the flop and my KK lost to QQ when a Ten hit the river giving him a straight to my lowly one pair. And this was the same player. END OF BAD BEAT STORY ALERT! Would I go there again on a Sunday? Yes? I would recommend buying in for at least $200 ($300 is the maximum buy-in) and be prepared to reload at least twice. The room was very nice and the chairs were the most comfortable ones that I have seen so far. Adjustable too. The dealers were very competent and friendly and for the most part, very professional. Bankroll update: Beginning balance $1,000, Ending balance $879, -$111 this visit. Where to play? Where to play? 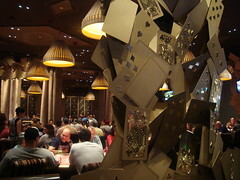 Vegas is home to many casinos that offer poker of various buy-ins and flavors. 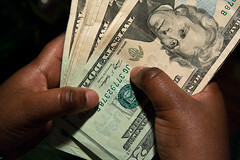 To be sure, you can find a cash game or a tournament in any price range to fit any budget. 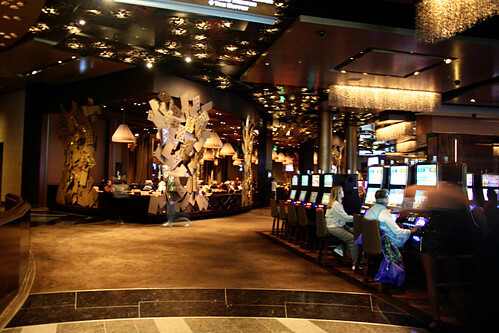 The following is a list of some of the casinos that offer No Limit Holdem at various limits. There are even out of town casinos that are close enough to Vegas and also offer poker. These too are as easy to find as searching the web. There even is an app for that, called “Bravo Poker Live” available on the web and as an Android app. To be sure, this list is not complete and is constantly changing. 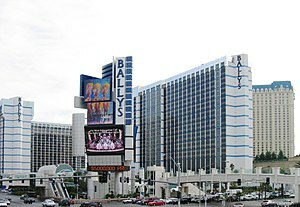 Included are links to either the “Poker Room” or “Casino” website, the address and phone number, and if available, the Twitter name to follow. Links and phone numbers were checked using Google search. Your results may vary. What to do – what to do! Having 20 buy-ins for No Limit Holdem, my maximum buy-in should be no more than $50 or a .25/.50 for a No Limit Hold’em game. Having 300 big blinds for Limit Holdem, my maximum buy-in should be no more than $3 big blind games for Limit. Having 40 buy-ins for Sit-N-Go’s, my maximum buy-in should be no more than $25 for these type of tourneys. This means that I am currently underfunded to play poker in Vegas. On the plus side, I am adding $240 to my bankroll a month from my allowance. (Diane and I each get a monthly allowance to cover day to day items not in our monthly budget plan). I also have the ability to grow my bankroll by adding to it by winning. Living in Vegas, I have found some .50/1.00 games of NL Holdem that would allow me to buy-in from $50 to $100. There are some limit games that would allow me to buy-in at $30 or $40 minimum but that would put me over the $3 per big blind recommendation. As far as Sit-n-Go’s at $25 or less, the lowest buy-in I found is $23 with $9 being charged for the admin fee. Because I am impatient, I am currently playing at games over my bankroll as I play in $1/$2 NL Holdem games with a minimum buy-in of $100. Most of the “Sit-N-Go’s” (really MTTs or Multi-table tournaments) that I play cost between $45 and $55 to play. As far as Limit cash games, well, I play so badly, I find no reason to play them at all. My most affordable game that I play is “Free”. That’s right, free online poker. Well, not really free but $20 a month (close to as free as you can get for a poker player). This allows me to play up to four games a day every month, or at least 112 tourneys minimum to as many as 124 tourneys a month. These free daily tourneys have a bonus feature. If you finish in the top three or four depending on how many players are enrolled in a month, you can win a buy-in up to $200 to use in a live tournament of your choice. The staking allows me to keep 60% of my winnings with 40% going back into the staking pool. This is a win win situation and provides motivation to improve, both online and life as well. Based on the above, I am going to be giving up my live tournaments and concentrate on cash games and the online game. (Well, not really give them up. If I win enough playing cash games, I will buy into some of the tourneys with my profits, such as they are). If I get staked from being an online winner, I hope to translate that to a win in a live tournament here in Vegas. Being here in Vegas has given me so much flexibility and has me very excited about the possibilities. Who know, even online poker might become a reality here in Vegas as well. Are you excited about the poker possibilities in your own life? February 1st, I saw on Twitter that @PokerGrump aka Bob Woolley, was leaving Las Vegas and that a special send off party was being given in his honor. The twitter hashtag was #Grumpament and the tourney was being held at the Treasure Island Poker Room. This would be a chance meet up with people that I have been following on Twitter for years, IRL (in real life). I got to the casino early and got the required ‘Player Card’ (each casino chain has their own rewards card, which also keeps track of how much you gamble and on what). I registered for the event then went in search of the real life people that were going to be here to send off @PokerGrump. I got to meet many people, some of whom I might not have remember for this post. In addition to @PokerGrump, there were: @Alaskagal1, @WriterJen, @FTrainpoker, @Snapple95, @Robvegaspoker, @PokerVixen, @Mitzula, @ChrisAbramski, and @ckbwop. At the 7 pm tournament there were almost 30 people playing on three tables. I lasted about an hour after the first break before running out of chips, cards and luck. My poker skills only got me so far. Of interest during the event, was a gentleman to my immediate right. He apologized all night long to the players next to him for his supposed bumbling behavior. He made numerous errors and had to be helped by everyone at our table, even the dealer. He ended up at the final table. I think we were hustled. Instead of him being the “fish” in our poker pond, he was the “SHARK” swimming around in search of our chips. After the tourney, many of the players ventured to a local watering hole to wish Bob well in his new adventures.